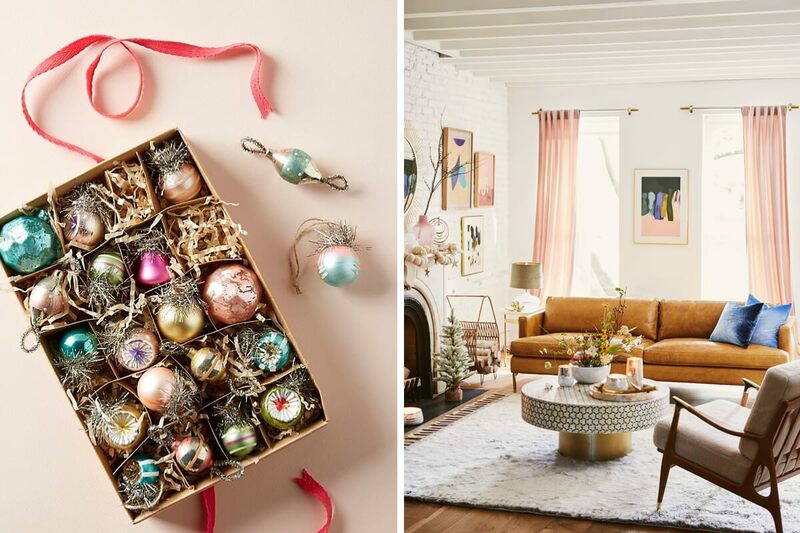 The holidays are still well off on the horizon (though it won’t feel that way for long), but we just couldn’t wait to introduce our newest design partner, Anthropologie. 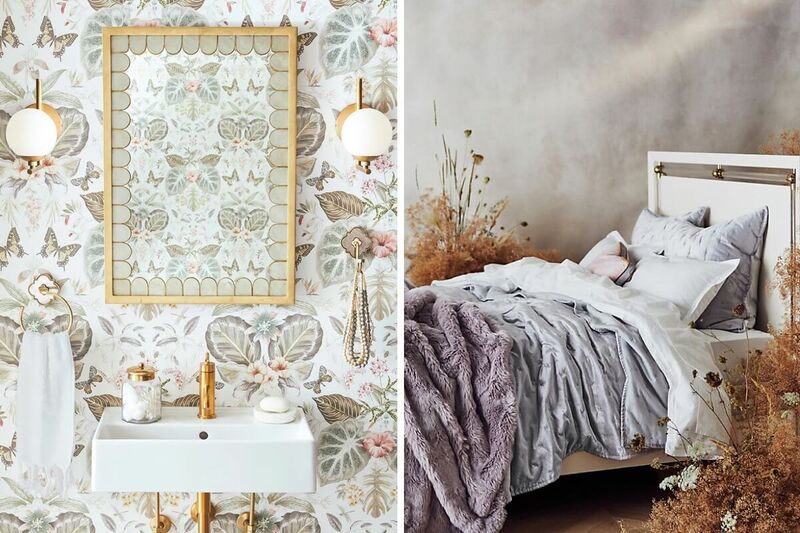 Known for their bohemian take on both home and fashion, we are thrilled to include Anthropologie in our family of design partners. 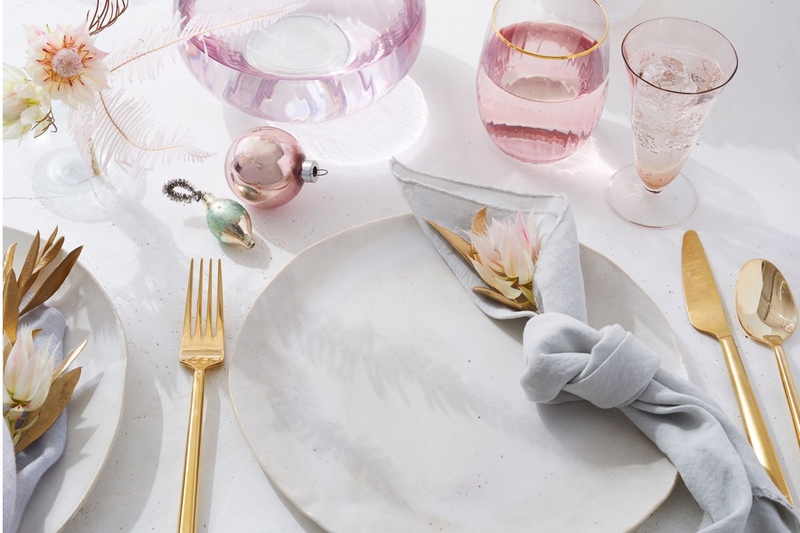 Our designers brought Anthropologie’s whimsical prints to life in charming color palettes, perfect for life’s events–from weddings to cocktails. To celebrate, we asked creative editor & social media director Jodie Harrison to tell us how to get your house looking its wintery best, just in time for holiday hosting. Here’s what she had to say on the unsung hero of the living room, the power of an aptly-placed bar cart, and all things hygge. 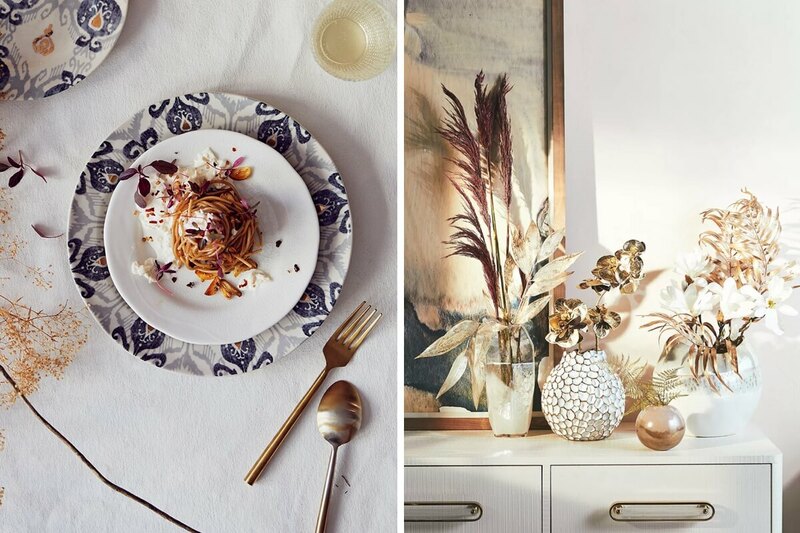 We’re introducing a lot of beautiful new entertaining and tabletop items that look really beautiful, and are so joyful. 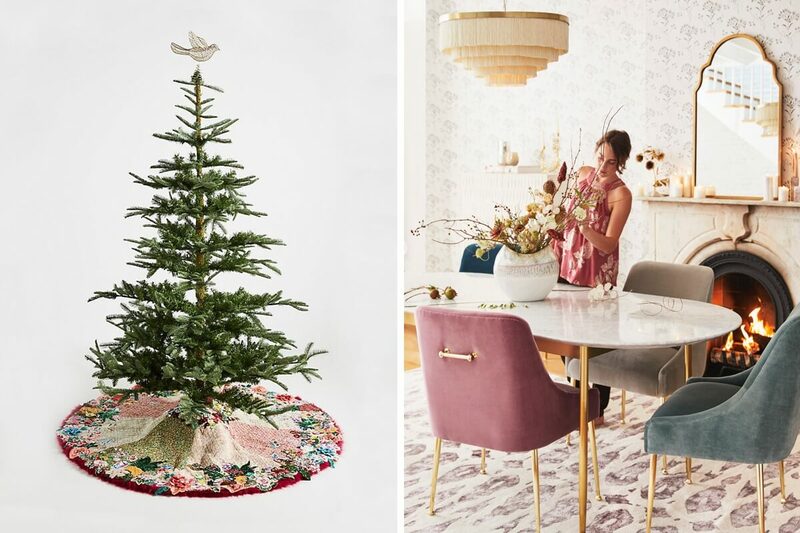 We like nostalgia around the holidays, but this year we also wanted a feeling of warmth and a welcoming spirit that mirrors how the Anthropologie customer layers and decorates their space. I think faux is having a pretty big moment right now. Obviously, they’ll never take the place of real flowers, but dried and faux stems are an additional element you can add to your home decor, and you can bring them out year after year. 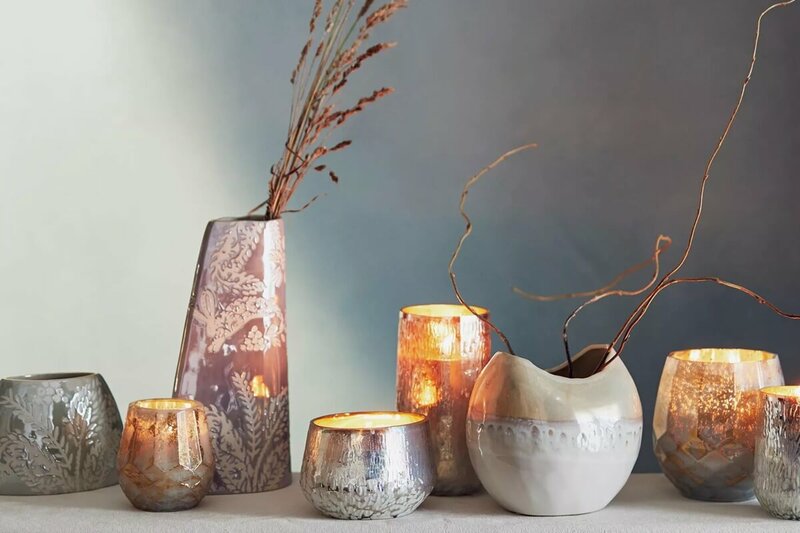 What we’ve tried to do this season is add different dimensions to the mantle; we’re combining more natural, organic textures like clay with iridescence and glass, and layering florals and twigs and things like that along the mantle. It gives it a very romantic sort of air. Not everybody has a fireplace in their home, so we’re looking at also utilizing shelf space in a modern way (or a window) to make that feel like an altar for the holidays. We’ve got the usual quirk, which people really come to us for every year. My tree, personally, is more minimal and Scandinavian. 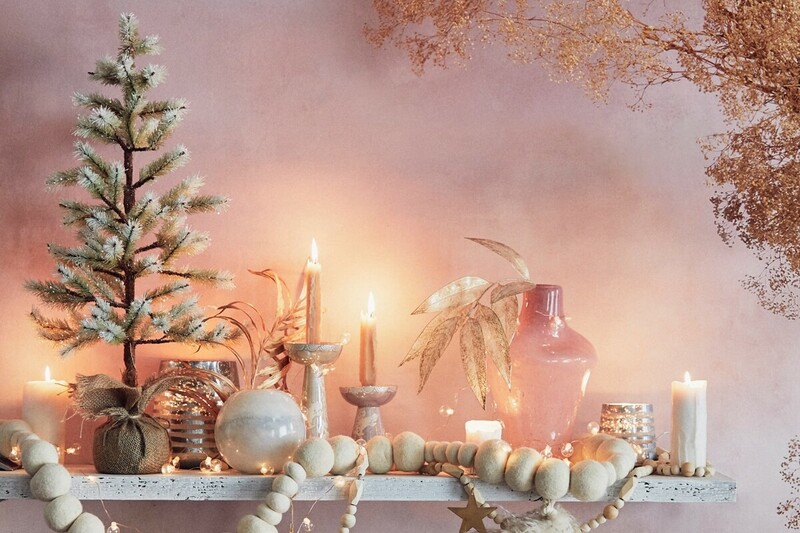 We’re introducing a selection of modern garlands that are perfect for that look. We’ve got really lovely wooden and felt garlands in light neutral shades. So, if you’re going for something more minimal with your tree (which is what I like to do) to celebrate the beauty of the tree itself, just use simple white ornaments and a cozy tree skirt. I think the coffee table is the unsung hero of the living room for the holidays. When it comes to the lounge area, I think we really focus on the tree and the coffee table kind of just sits there in its usual way. I’m definitely thinking about putting garlands and foliage on my coffee table. They can really be made over to be much more festive than they usually are. It’s nice to think about the guest bedroom and the guest bathroom. Whenever I go to a house and the guest feels a sense of stress it makes it less welcoming. So for me, it’s all about preparing ahead of time, making sure the food is done ahead of time, that everything is ready to go so that when guests arrive so I can be fully present and not worrying. My parents are coming for the holidays this year, and I’m introducing a bar cart in the guest room. I just want to make it so they have everything at the ready. I try to think of those little details and become obsessed with creating a home away from home. We’ve got loads of faux furs coming in, which are super cozy and should make any guest bedroom feel really welcome and warm. My mother would have this selection of stuff that she would take to parties and none of it felt particularly personalized. So, I think what I’m going to try to do, and what we’ve gotten much more into, is monograms. We’ve got monogram candles coming out, new necklaces, and also bag charms. A great hostess gift is something they see every day, like a keychain, rather than the default bottle of wine. I’m also planning on doing two waves of decor. First, I’ll do something pretty for Thanksgiving, and then a refresh in early December in order to make sure I don’t get bored. I get bored quickly and want to change it up. I’ve learned how to make an Eastern Standard, which is my one of my favorite cocktails. So I will be serving those on Christmas Eve. A coupe glass, which is a beautiful French Champagne glass, makes any drink feel like a real event. I love dressing up on Christmas Day. This year I’m really into set dressing. I’ve got my eye on a really cute sweetheart top with a lovely leather skirt that matches so it looks like a dress, but then you can wear each part separately. It’s really three outfits, effectively. So, I will be wearing that. So don your best two-piece holiday dress set, keep the decor fresh and the drinks fresher, and by all means give the coffee table its fair due. Now get to holiday happenings! Step one: learn how to get your home ready for holiday guests. 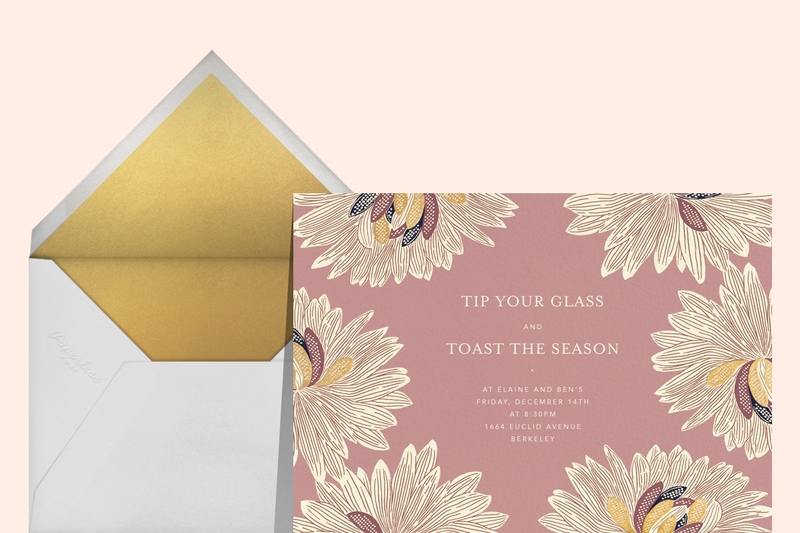 Step two: invite them over with the new Anthropologie invitation collection or a Flyer.